Science fiction wouldn’t be very interesting if space was a peaceful place, would it? Thankfully, Star Realms isn’t about bringing peace to the skyways. It’s all about controlling them! 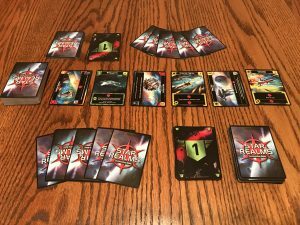 Star Realms is a basic deckbuilding game where players construct their own fleet to dominate the stars. Players begin with fifty Authority, which function as hit points. The first player to reach zero Authority loses. Cards break down into three basic functions: trade, attack, and healing. Trade allows players to purchase ships from the trade row, a series of cards laid out in the center. Attack allows you to destroy enemy bases or reduce an opponent’s Authority. Healing, as you might have guessed, grants you additional Authority. Ships are divided into four different factions: Blob, Trade Federation, Star Empire, and Machine Cult. You can purchase as many ships as you want from any faction, though it is advantageous to focus on one or two since most ships have an ally bonus. 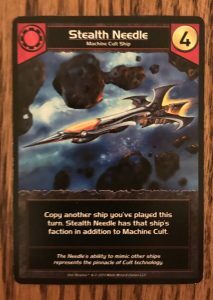 If you play additional ships from the same faction, you get additional effects. These bonuses can stack quite nicely and are key to winning the game. One deck is enough to support two players, but there are rules for up to six players. If you want to add more players, just add additional decks and you’re good to go. Star Realms travels well. All you need is the deck of cards, contained in a small box. Are you and a friend waiting for someone? Put your phone away and break out some Star Realms! 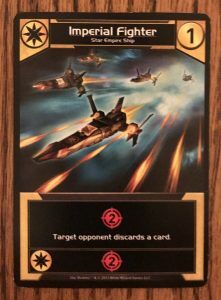 Star Realms is also simple to learn. This is an easy game to teach to kids or people who don’t play a lot of games. The art is creative. The ships are great to look at and the factions have distinct thematic flavor to them. For such a small game, it really does feel like the game designers created their own sci-fi world. The major drawback comes down to your expectations. It is a bit strategically shallow. Don’t get me wrong – the game mechanics are satisfying. However, the game is limited so don’t expect as many options as you might find in larger dueling card games. Multiplayer requires multiple decks. I don’t play a lot of one-on-one games, so this is a drawback to me. Star Realms doesn’t come ready to play out of the box for more than two people. I was introduced to this game in graduate school. A friend brought it to the library and we would bust it out when we needed a study break during final exams. When I’m having a game night with friends, I typically want to reach for something bigger but Star Realms is a go-to option when I only have twenty minutes or so. It’s face-paced, straightforward, and thematically satisfying. 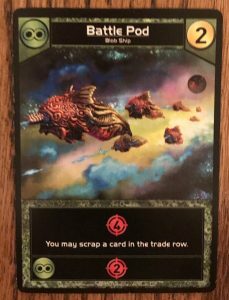 If you’re looking for a game you can play quickly, I definitely recommend looking into Star Realms. 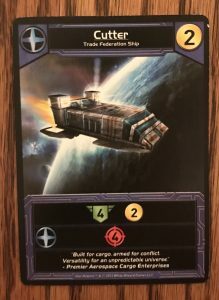 This entry was posted in Articles, Board Games, Review and tagged Article, Board Games, Card Games, Deckbuilding, Review. Bookmark the permalink.